SPEAKING OF THE DEVIL! 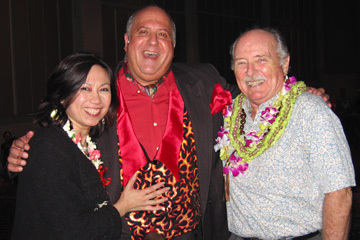 : Larry Bialock, center, was still in costume as the Devil, a k a Mr. Applegate, as he relaxed on stage with choreographer Deanna Luster and director Jim Hutchison after "Damn Yankees" opened Thursday at Army Community Theatre. Bialock is not officially the star of the show, but he owns every scene he appears in. Bialock plays the Devil as a dangerous yet perversely likable fellow. His big musical number, "Those Were the Good Old Days," is one of the best moments in the show. WHATEVER 'BIT' WANTS: Elizabeth Harrison, perfectly cast in "Damn Yankees" as seductive temptress Lola, greeted well-wisher Vincent Green after the opening-night show. Harrison, also known as "Bit," makes a powerful entrance with her show-stopping rendition of "A Little Brains, A Little Talent," shows good comic skills with "Whatever Lola Wants" and steals the show with her singing and dancing in the big nightclub sequence in Act 2. THINKING PINK: Pink beverages were the drink of choice, but the term "heavy pupus" didn't do justice to the buffet at "Pink Martini Night," a fundraiser for the Hawaii Affiliate of the Susan G. Komen Breast Cancer Foundation at Indigo May 8. 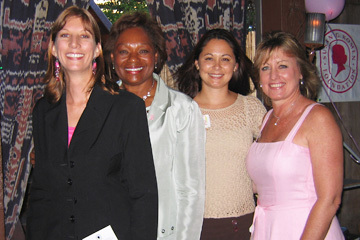 Marcy Thomas, left, Paulette Williams, Darcie Yukimura and Jeri Steiner shared credit for the great party. 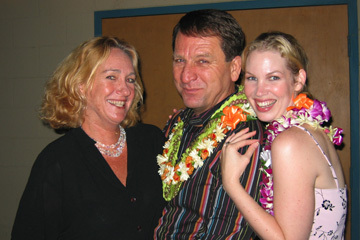 'FOREIGNER' AFFAIRS: Betty Burdick, left, talked with director Jerry Tracy and cast member Genny Wilson at the opening-night party for Manoa Valley Theatre's production of "The Foreigner" May 3. A joke in the script inspired Tracy to give "thin candles and baby carrots" to the cast after the show. 'THE PHANTOM OF THE LAB': Celebrity hairstylist Katsumi Kasai touched up Lisa Shibaoka as Betsy Lum, left, and Katrina Birkholm looked on during the formal opening of the DFS Beauty Lab in Waikiki May 2 (Birkholm is demonstrating a special Muran facial mask). The Lab is open to Hawaii residents.